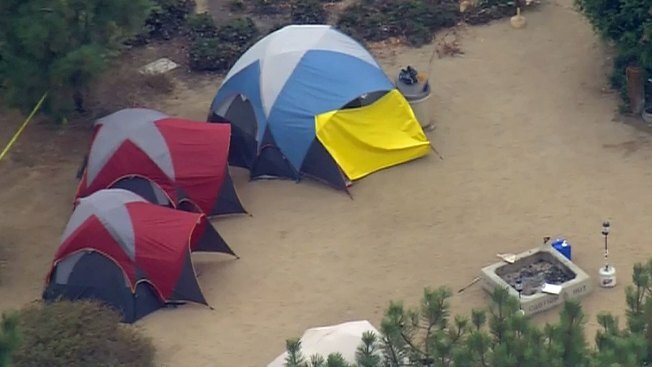 The deadly shooting of a 12-year-old Boy Scout at a summer camp in San Diego appeared at first to be self-inflicted, but now investigators are interviewing witnesses and examining forensic evidence to determine the cause of death. The boy was shot at a campsite at the Fiesta Island Youth Camp and Youth Aquatic Center in Mission Bay on Monday morning, just a day after he had arrived with a troop of about 20 scouts from Las Vegas, police said. San Diego police responding to a report of a suicide attempt at 7:35 a.m. found the victim inside a tent with a handgun nearby, Lt. Mike Hastings said. Paramedics tried to revive him, but he was pronounced dead at the campsite, fire officials said. Investigators said Monday afternoon that the boy may have been shot more than once in the upper torso, but would not say where the scout was wounded or how many times he was shot. Earlier, police had said the boy had shot himself in the head. While investigators would not comment on whether anyone else were in the tent at time of the shooting, they said there are no eye witnesses. Officials say they will not be able to determine if the shooting were a suicide until an autopsy has established the bullet's trajectory. Just after the shooting Monday morning, police blocked off the camp entrance and began interviewing scouts and leaders, including the child's father, who was present at the camp. The campground will be closed to outside people until the investigation is complete. Homicide and child abuse investigators were assisting in the case, while lab technicians processed forensic evidence. Caterer Robert Peletier was serving breakfast to about 400 scouts at the camp when he saw the shooting's immediate aftermath, including lots of tears when the victim's Las Vegas troop was told of the tragedy. Bob Jones, the grandfather of another camper, had just arrived to the camp early Monday to bring his 12-year-old grandson trail mix when he learned of the shooting. His eyes watering, Jones said he was shocked and also concerned for his grandson who has been diagnosed as autistic. "I know this will affect him emotionally so I would just like to be there for him," Jones said. "I'd like to get some word to him if I can." The Bay Park resident said camp was scheduled to last the week. A camp counselor walked out Monday morning to talk with parents who had gathered near the entrance to the camp. He would not discuss reports of a shooting but did confirm there was no firearms program at the camp. An NBC 7 news crew on the scene said there was a large group of scouts gathered in the center of camp just after 9 a.m. It's not known what was announced to the group. Parents have not been told to come and pick up their kids, and camp will continue as usual. Crisis counselors were made available by the San Diego Police Department to those attending the camp, and the director of camping for the San Diego Boy Scouts council responded to the shooting in a statement Monday. "This is an extremely sad day for our entire Scouting family. Our thoughts and prayers are with the families and all those who experienced this tragedy," camping director Karl Shelton said. "Our top priority is providing support to our community and for those in the grieving process. Grief counselors are on site and available to support those who are involved. "It is during these trying times that we renew our commitment to our nation's youth and come together as a community to do all that we can to support each other," Shelton added. The Boy Scouts of America runs a summer camp on the patch of land in the middle of Mission Bay from June to August, offering merit badge opportunities in everything from kayaking to SCUBA to fire safety. The location focuses on aquatics activities and does not include a shooting range. San Diego County provide free and confidential support for those in crisis or need immediate help. Phones at the Crisis Hotline at (888) 724-7240 are answered by trained professionals available 24/7. The call is free and confidential. As of Monday evening, no arrests had been made. An autopsy was scheduled for Tuesday.